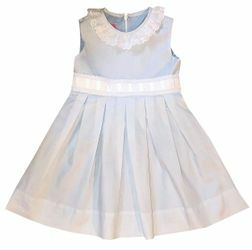 What a beautiful heirloom batiste dress for toddlers and little girls by Claire & Charlie. It is made in blue with a side sashes that tie into a big fully white bow in the back. 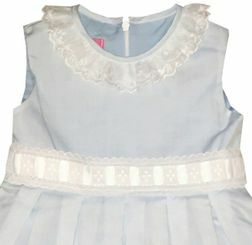 The neck is embellished with a swiss dot eyelet ruffle. The most lovely portion is the front waist wide beading woven with white satin ribbon trimmed in the swiss eyelet. Lovely for Easter, church and special occasions!